Marilyn Nutter is guest posting to this site today. Marilyn, a recent widow like us, has her own dilemmas to face and decisions to make as she steps out into her new life. You can read more from Marilyn at http://www.marilynnutter.com. I first met Marilyn online after submitting a devotion to her for her Devotional called Penned from the Heart. We clicked and I know you will click with Marilyn as well. Widowhood brings new decisions, and one of mine has been to put my house on the market. My realtor arranged for a stager to tour my house and see which things should be removed and adjusted so buyers see my house in the best light. She moved the angle of a carpet in my half-bathroom (an interesting detail that made a difference), removed some curtains to let more light in, shifted décor so that the eye went to the right place, and recommended that I clear out a closet to reduce clutter. I got to work on the closet. I sorted and purged; packed things in bins and boxes and made two trips to Goodwill. I rented a storage unit, loaded my vehicle and moved the boxes into a climate controlled unit. Looking, thinking, lifting, moving, giving. It proved to be a good exercise for me. The closet looks better. I feel better. I’m optimistic that my house will sell in God’s timing and that He will move me to the right house. I often see the application of spiritual truths from object lessons in every day living. This was one of those times. As the name of this blog suggests, widowhood is more than grief of our husband’s death. From day one, facing life in the new status of “single”, our burdens vary: single decisions without the benefit of shared wisdom; “my” plans, not “ours”; new choices; learning new skills; fatigue; financial adjustments; new friendships; not “fitting in” in former activities; loneliness; change. No two widows face their new life in the same way. Circumstances, marriages, and personalities are unique, but it is safe to say that “change” is a label for each woman. Sometimes it is overwhelming. So I got to work (alone), packed boxes, loaded my vehicle and drove to the storage unit. I punched in the code to enter and the gate opened. I unlocked the first door, unloaded and took the boxes to my unit. I turned the key on the padlock and stacked my boxes. I pulled down the door, locked the unit and the exit door, got into my vehicle, used the access code to exit, and drove away. Sometimes I pushed the bins down the corridor because they were heavy. I left my boxes there. I accomplished something good even though my muscles (and at times, my heart) hurt. That evening I took some time to rest. As I reflected on that day, I saw a parallel to my widowhood journey. If I want my house to sell, I had to present it in the best light. That meant making adjustments and following the recommendations of the stager and realtor. In a sense, they invited me to “come” and “take” their suggestions and “learn” the best way to present my house to others. 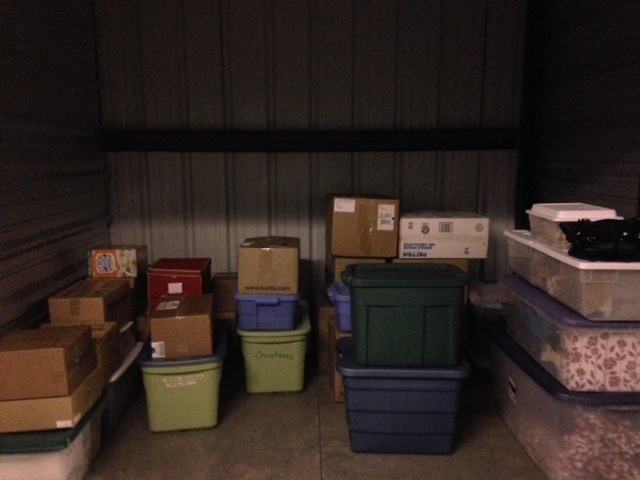 I cleaned and then packed, lifted boxes and bins and left them in the storage unit. Now with reduced clutter and rearrangement, it’s the same house, but it looks different. The Lord invites us to “come” and “take” our burdens to Him; to spend time and “learn” from Him and find His rest. Our widowhood is irreversible. Our status is the same yesterday as today. It’s the same house, so to speak, but His compassions are renewed for us each day. In giving myself to come, learn, and take, He removes distractions and doubt and gives focus with His light. The burdens are lighter when I give them over to His wisdom and care, and His faithfulness is my companion. It’s the same house but I look different. I have more light.